It’s the midpoint of the seven-year Tribulation. A renowned man is dead, and the world mourns. In heaven, the battle of the ages continues to rage until it spills to earth and hell breaks loose. Book 7 in the Left Behind end-times thriller series, by Time LaHaye and Jerry B. Jenkins. Time and eternity seem suspended, and the destiny of mankind hangs in the balance. It’s the midpoint of the seven-year Tribulation. A renowned man is dead, and the world mourns. In heaven, the battle of the ages continues to rage until it spills to earth and hell breaks loose. The members of the Tribulation Force — just three in the safe house and the rest scattered about the globe — face their most dangerous challenges. Some are murder suspects; others test the precarious line between subversion and being revealed. Rayford Steele must escape Israel. Buck Williams must find a friend. Chloe Steele Williams despairs for her life and the life of her baby. Tsion Ben-Judah becomes a man who dreams dreams. Meanwhile, David, Annie, Mac, and Abdullah live life on the edge, toiling inside the very lair of the evil one, always a breath away from lives as fugitives. Is the safe house really safe anymore? Is a Trib Force member guilty of murder? Who is the next comrade to die? Has their help come from too unlikely a source? 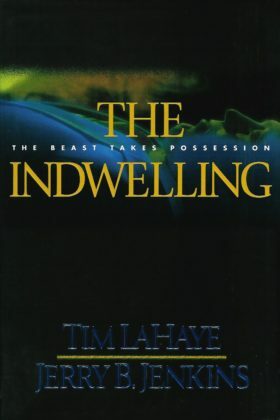 Whether you’re a fan of the Left Behind series or a newcomer, The Indwelling will keep you riveted from its surprising revelations to its newly provoked questions. Book 7 in the Left Behind end-times thriller series, by Time LaHaye and Jerry B. Jenkins.